Environmental activists have broken through police lines and stormed a lignite mine in western Germany, protesting against the use of coal. A few people from the group EndeGelaende, which translates as “It’s finished now”, managed to break through police lines. The incident took place in Garzweiler, west of Cologne, local DPA news agency reported. The trespass caused the step-up in security: 1,200 police officers arrived at the site and made several arrests. Officers used pepper spray, batons, and tear gas against the demonstrators, and were removing the activists from the scene, according to police spokesman Anton Hamacher, as quoted by AP. Bucket-wheel excavators had to be closed for safety reasons during the protest, the spokesman for German energy company RWE, in charge of the mine, Lothar Lambertz, said. Also, RWE decided not to bring employees onto the site to rally in favor of coal mining, Lambertz added. The surface mine in Garzweiler is estimated as the biggest source of carbon dioxide emissions in Europe. 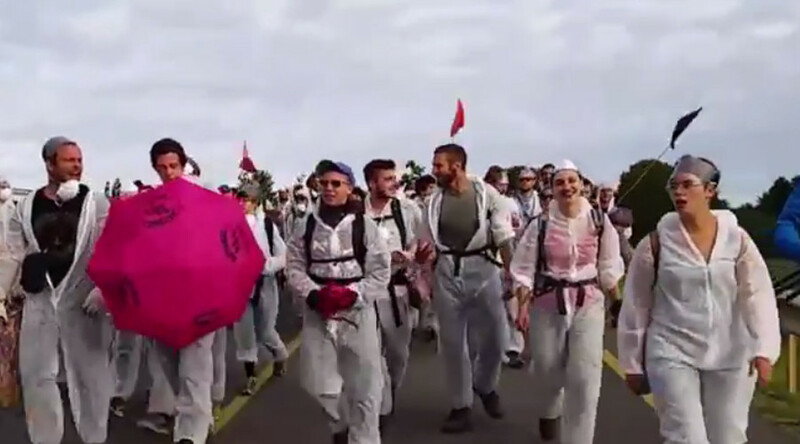 The EndeGelaende is a coalition of anti-nuclear and anti-coal movements who gathered together to protest specifically against coal mining. In July, Germany gave up on plans to reduce coal-fired power plants, but will diminish brown-coal power generation to keep its 2020 carbon-reduction targets. Coal currently provides about 44 percent of Germany's power generation.